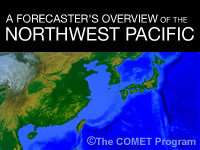 This module provides an introduction to the northwest Pacific for weather forecasters. It touches on major aspects of the geography, oceanography, and climatology. Geography looks at plate tectonics, topography, and human population. Oceanography examines ocean currents, coastal tidal ranges, and sea ice distribution. Climatology briefly discusses jets streams, distribution of synoptic features, storm tracks of tropical and extratropical cyclones, the fronts, and sensible weather associated with the Northeast and Southwest Monsoons. I don't really have much negative to say. Everything was direct and to the point making what was being asked easy to comprehend. Great quiz and structure. I will say that a lot of questions could simply be logically deduced by looking at the maps which to me helps with understanding completely after finding that my theories of answering we correct. This training coincides with my agriculture, and economic stimulation, internationally. Comprehensive review of northwest pacific weather and climate.